According to a new road safety report from the City of London, the improvement in its road safety record is 'significant' particularly over the longer term. These claims do not stand up to scrutiny, however. Using the City's own data and plotting it in a more sensible way that done in the report shows a very different picture to the City's claims. Although there was a slight drop in slight collisions in 2009, the last year figures were available when the report was drawn up, this seems to be a result of the random statistical variation that is usual in this sort of data. The graph above shows just two statistically valid trends. First a drop in serious injuries during the late 1990s. This may well be due to the introduction of the City's Traffic & Environment Zone, more commonly known as the anti-terrorist 'Ring of Steel', which reduced routes for motor traffic through the City. 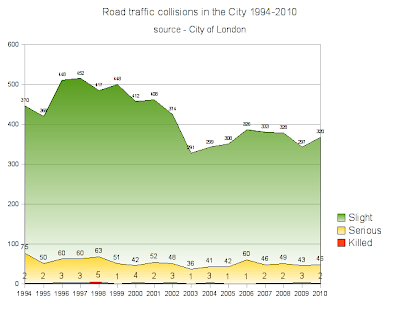 The other trend is a sharp drop in slight injury collisions in 2003, coinciding with the introduction of the Congestion Charge Zone and a significant drop in motor traffic. For over a decade, there has been no reduction in Killed or Seriously Injured ('KSI') collision rate, set by the Government as the key performance indicator for road safety. In this regard it is useful to compare the City's performance to the targets it was set, in addition to the performance of neighbouring London boroughs. Most surprisingly, any such comparison was absent from the City's road safety report, perhaps the chart below shows why. The chart clearly shows that the City's performance not only fell far short of its target for 2010 (second and last set of bars). Note that the KSI figures for 2010 were similar to those for 2008, except for cycling where they were even worse. The chart also shows that the City's performance was worse than any neighbouring authority overall but in particular for walking and cycling. This means that not only does the City have the worst record of anywhere in London, it is probably one of, if not the worst of any local authority in the UK. Cycling levels are likely to triple in the City over the next decade (according to the City's own targets) while walking will increase significantly with the completion of new skyscrapers and the new Crossrail and upgraded Thameslink rail services. The concept of a balanced transport strategy would require less motor traffic as walking and cycling increase. But the City seems dead set against this. Indeed the performance gap between neighbouring authorities, which are rolling out 20mph and planning for motor traffic reduction, and the City, which is not, is likely to grow. The continuing failure of the City to set out any credible means by which it will reduce road casualties means that it may be difficult for the Mayor to be able to approve the City's Local (Transport) Implementation Plan, in accordance with the statutory requirement for it to further the Mayor's Transport Strategy, which includes a goal to improve road safety. The City claims it is doing okay because cycling levels have more than doubled and cycling collisions have increased by only 143%. But this ignores the proven 'safety in numbers' effect. Cycling risk decreases 35-40% as numbers double (known as the 'safety in numbers' effect). So if cycling levels quadrupled, say from 10,000 to 40,000 per day, one would expect, all other things being equal, cycling KSI to increase by two-thirds. Of course there have been various road safety and cycling schemes implemented so the KSI increase should be less than this. The fact that the City's record for pedestrian KSI is so bad too (there were very few serious collisions between cyclists and pedestrians) is further evidence to suggest something is going badly wrong. The City likes to blame cyclists, saying that most bad cycling accidents involve cyclists undertaking large vehicles. While it is true that many cycling fatalities involve cyclists being on the inside of lorries, this is often because lorries cut up cyclists before turning left, as happened to Alex McVitty who was crushed by a cement mixer on London Wall that had just overtaken her. In terms of serious collisions involving cyclists, there are many different causes. Despite being challenged on this point, the City's Road Safety Team keeps making these misleading claims. The City's answer to road safety is to education and publicity about safer behaviour, rather than actually trying to make the roads safer. But as the heart of a global financial centre, with a high 'churn' in employees, few residents and many visitors, this is a very inefficient and ineffective use of resources. The City's claim that its education campaigns are working but that they will 'take time' to have an impact clearly don't add up. Can't help but wonder aren't there any consequences for misleading the public? Also it almost looks like criminal negligence. Indeed, there is no 'safety in numbers' in the City. But there is everywhere else in London. So, why has the City got worse when risk of cycling has fallen elsewhere? "There is greater political will to improve cycling conditions"
Arguably that has occurred elsewhere - as you say, other boroughs have pursued speed and motor traffic reduction. Why has a lack of political will to make cycling safer and better not occurred to the same extent in the City? Lack of political will might have something to do with the fact that the City isn't democratic. I've done a post on cycling casualties in the City here: http://is.gd/SVityB. There is some evidence to suggest that the 'safety in numbers' effect may have operated previously but not any more. It certainly doesn't look like the City can both grow cycling and reduce KSIs without some significant improvement in conditions for cyclists. I think road safety should be a responsibility of everyone. If more drivers would be responsible on the road, the lesser road accidents would happen.